Americans have always been a "do it yourself" society and with all the DIY television programs, books, and websites, doing it yourself has never been easier. But some things we tend to take for granted and we end up making mistakes. Like lawn maintenance and landscaping around our homes. This is not a comprehensive list of the numbers of things that can go wrong with your residential landscaping efforts. However, these are some of most common ones that can happen to just about any homeowner. While most everyone wants to keep up on property maintenance and for their lawns to look healthy and attractive, homeowners looking to sell their house this spring are especially keen to get it right. The first thing you should have is a plan. It is a huge benefit to decide on what you want to accomplish and then get it down on paper. For example, decide where you want to put particular plants to complement the shape and style of your house. Look at the whole property and think about placements and variety that will give you a nice and appealing design. Include your budget in your plan and keep to it when you go to buy plants and materials. Having a well thought out plan - and sticking to it - will help you avoid costly mistakes and wasted labor. With all of the current focus on backyard retreats, barbecue islands, and outdoor theaters, it is easy to forget the need for simple curb appeal. The front of the house is where first impressions are made and too many homeowners simply settle for mowing the lawn and keeping it clean. But there is much more that can be done without launching a major project there. For example, you can paint your front door with an eye-catching color that stands out from but complements the base color of your home. In addition to keeping the grass trim and healthy, you can plant colorful flowers and even install some lawn ornamentation. These steps are particularly critical if you are planning to sell your home this spring. Believe it or not, it is possible to kill a young tree by planting it too deeply. Many times a novice tree-planter will dig a hole that is too deep and too wide, and then stamp extra soil around the filled hole. But this can actually choke the tree and eventually kill it because not enough air is allowed to go to the root system. In addition, planting a tree to deeply can encourage root rot. The trick is to use the tree's main stem as a gauge. This is the point where the largest branch is and where all of the tendrils come out. This is known as the root ball. The surface of your planting hole should meet at that point and no higher. Another trick is to simply dig your hole to match the actual height of the container in which the tree or shrub comes in. For many homeowners it is tempting to cut their grass shorter thinking they won't have to mow it as often. However, this can actually cause more harm to your lawn than frequent mowing. Excessively short lawn grass can result in a bare patches, which makes it more vulnerable to insects and susceptible to disease. In addition, some lawn pests such as crabgrass thrive in short lawns. A healthier strategy is to mow your lawn at varying heights each time you cut your grass. Depending on your climate, your lawn may need a more shade in the summers, so let the blades grow a bit more between mowings and don't cut them too short. This can also keep water from evaporating quickly. Speaking of water, this is an area that many homeowners puzzle over. On one hand, many homeowners make the mistake of over-watering. But the reality is that most lawns only need about an inch of a water per week. On the other hand, some simply water when the lawn starts to look dry which can lead to the grass being stressed and becoming unhealthy. Typically, the best time of day to water your lawn is early mornings. This way the water has time to soak into the soil before the sun comes up. Most people can't take the time to go out and turn on the sprinkler before sunrise. However, you can get a sprinkler with an automatic timer or even consider putting in an irrigation system. Fertilizing is often a necessity for many lawns and landscaping areas with various types of plants. And this means knowing what you have and what it needs to be fertilized properly. A common mistake, however, is to simply not fertilize at all which can be as damaging as fertilizing too much or fertilizing improperly. If you are uncertain as to what type of fertilizer to use or how much, the best strategy is to ask your local nursery or garden center. They can recommend a proper fertilizer for your yard or plants. Typically, it is recommended to fertilize at least twice a year in the spring and again in the fall. 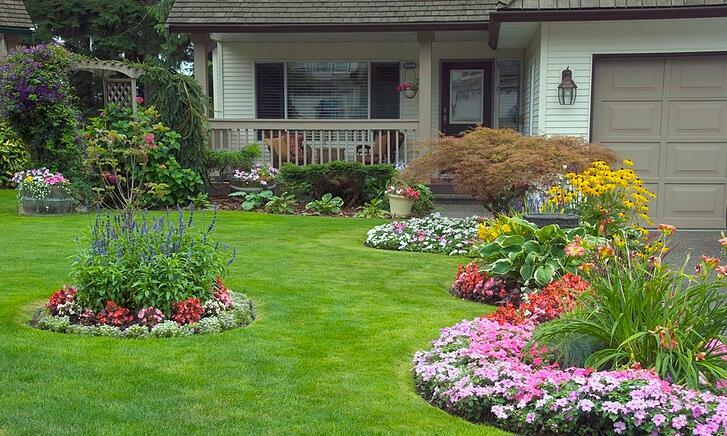 Avoid fertilizing in bright sunlight and water well after applying the fertilizer. Mixing in some fertilizer when planting a new plant is a great way to help ensure it's success. Simply add some fertilizer with the soil to allow for a gradual feeding of fertilizer to your new plant over time. Landscaping projects can produce a large amount of waste and debris that will need to be disposed of at some point. Depending on the scale of your project this may be far more than you can easily fit into a municipal "green" bin. However, many homeowners overlook the potential in recycling waste for valuable mulch and compost in their debris. You can rent a shredder and simply turn much of the smaller branches and clippings into mulch and your lawn clippings can be spread back onto the lawn. In addition to sustaining and conditioning the soil, they are great fertilizers. You can also consider creating a permanent compost pile or even buying a compost container. Sometimes, however, the volume and size of your landscaping debris means having to get rid of it. But there is a good solution. One of the inevitable realities of any DIY yard project is the need for continual clean up lawn debris removal. A great option is to rent a dumpster for collecting and disposing of all your project debris. And now you have the option of using MINI-dumpster drop-off services from Junk King. Homeowners can rent and load these revolutionary Mini dumpster boxes. Equipped with special polycarbonate wheels, these driveway-friendly boxes will arrive on-site without causing damage to a driveway or property. These rental boxes are great self-service dumpsters for landscaping projects, home renovations and any other type of cleanup. And the small size offers a dumpster that is compact and easy to use. Our affordable dumpster rental service has an online booking system and Junk King will drop off the dumpster and arrange for it to be picked up once it's filled. The materials will be sorted so the items can be reused, repurposed and recycled. In addition to redirecting materials away from landfills, the services are insured to make certain nothing is lost or damaged. In terms of pricing, customers only pay for the space used. Whether you are sprucing up your landscaping or preparing to sell your home, we provide our customers with the tools they need to clear away landscaping debris. With a professional and friendly crew that will do the heavy lifting for you, or a convenient MINI dumpster that allows you to do it yourself, we make your residential junk removal easy. Junk King's MINI dumpsters are easy, affordable and convenient. Rent a MINI today for your DIY landscaping project, cleanout, and disposal needs. Book online today!